Virginia Willcock during one of Vasse Felix's grape harvests. Virginia Willcock is the Chief winemaker at Margaret River’s founding wine estate, Vasse Felix, and has been since October 2006. 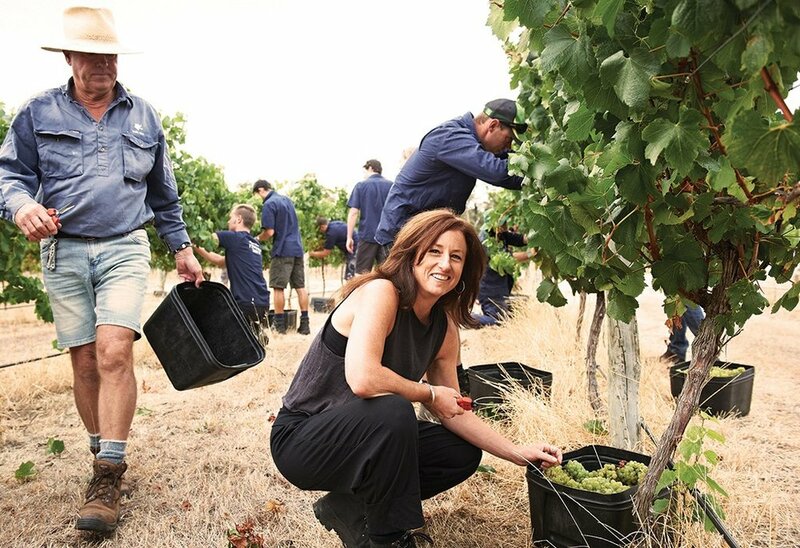 In this time she has racked up three Winemaker of the Year awards – the most recent of which was at the 2017 Australian Women in Wine Awards (AWIWA) held in London in November. Under her winemaking direction, Vasse was named Winery of the Year 2017 by Wine Enthusiast mag in the United States. She’s got 32 vintages of winemaking under her belt, 26 of which have been in Margaret River. She is on the record as saying “I wouldn’t want to be making wine anywhere else!” (We agree – don’t go!). Just between us, Vasse Felix winery (and Virginia herself) consistently put the Margaret River wine region before their own interests, with the fervent belief that a ‘high tide raises all boats’, so she (and the winery) probably wouldn’t want us to highlight all of her individual assets above those of the region. But truly, we have before us an embarrassment of riches… Vasse are home to the oldest vines in the Margaret River region (the Tom Cullity block on the estate, planted 1967 by Dr Tom Cullity) with which Virginia and her team consistently produce among the greatest wines in the region, each vintage. If you’re fortunate enough to be able to spend even a few minutes in Virginia’s presence, you’ll meet a vibrant, relaxed, knowledgeable, dedicated and energetic person. She’s fun. She smiles a lot. And she knows her s**t back-to-front. Things quickly turn serious if you ask about grapes, soils, vintages, growing conditions, weather patterns, details about individual plots in the vineyards, barrels, fermentations… the list goes on – you’ll want to have brought a pen. We can’t say enough about her vast store of knowledge and experience. The thing that sets Virginia apart from the pack, isn’t just the personal achievement awards (Winemaker of the Year etc); it’s not just the acclaim she’s attracted to Vasse Felix winery; it’s not just the high scores each year for the wines from Vasse Felix, it’s not just her vivacious ‘off-field’ conduct; and it’s not just the respected and precise palate and knowledge that she is so willing to share with others in the industry: it’s that Virginia manages to bring all of these things into her winemaking for Vasse Felix. And the wines aren’t exorbitantly priced, they start at $15. For anyone already a fan of Vasse Felix wines, you’ll know that in each style and price range, Vasse produces each year, some of the best examples of Margaret River Cabernet, Chardonnay and Semillon/Sauvignon blancs on the market. Every. Single. Year. Come and check out our full range of all Viriginia's wines from Vasse Felix at your local Liquor Barons store.